Genie protective solutions continue to evolve. Highlighting a new generation in innovative solutions, a prototype of the Genie Lift Guard Contact Alarm system for Genie GS slab scissor lifts and Genie GR, GRC and QS vertical masts will be shown to customers in North America during the OSHA National Safety-Stand Down, May 7-11. This system is an electronic secondary guarding solution designed to activate when an obstruction makes contact with an activation whisker mounted to the lift’s platform guardrails, alerting operators, occupants and ground personnel to a potential hazard. The prototype will also be shown to Genie customers during Vertikal Days in Leicestershire, United Kingdom, May 16-17, and at HIRE18 in Brisbane, Australia, May 30-31. 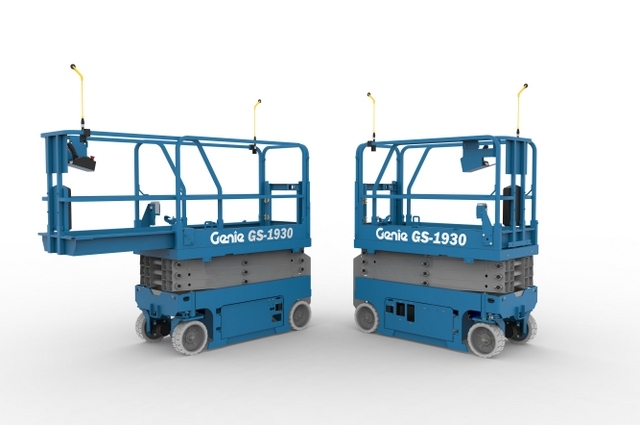 According to Flanagan, the standard configuration for the Genie Lift Guard Contact Alarm system for slab scissors and vertical mast lifts will include two activation whiskers — one mounted on the front of the platform and one mounted on the rear. The Genie Lift Guard Contact Alarm system for slab scissors and vertical mast lists is designed to activate when an activation whisker is deflected by an obstruction, triggering the limit switch in the base of the assembly. When the system is activated, all machine motion will stop, an alarm will sound and beacons will flash. The operator will be able to continue driving or elevating the platform into the desired working position after acknowledging the activation system and machine stopped condition. According to Flanagan, a free-movement zone will exist between the activation whisker and guardrail, to allow mobility for operators and occupants after the system is activated. “Genie customers throughout the world are committed to workplace safety, and we want to support their efforts with focused market solutions. We designed the Genie Lift Guard Contact Alarm system for slab scissor lifts and vertical masts to provide a level of secondary guarding equivalent to that available on boom lifts, in a package that meets the unique needs of scissor and vertical mast lift applications,” says Flanagan. The Genie Lift Guard Contact Alarm system for slab scissor lifts and vertical mast lifts will go into production in late 2018. A retrofit kit will be available at time of production to allow for compatibility with Genie Smart Link system-enabled scissor lifts and vertical masts produced from 2011-2018. For more information about Genie, click this link. No heavy lifting required.